Happy Friday!! I know many of you have already started your summer break...but if you are like me, you are still in school!! I wanted to share my end of the year gift for my students in this post! I have done many different things throughout the years for my students at the end of the year. Sometimes I use my Scholastic points and get each student a book. Other years I have given them an A to Z memory book. I put pictures of different things we have done on each page that start with each letter of the alphabet. I have also made folders for my students with their work and any pictures I have taken of them throughout the year. So many different gift options! This year I have seen SO many wonderful ideas on Instagram! I thought the idea of sunglasses was super adorable so I made some of my own tags to use! I got some adorable sunglasses from the Dollar Store. They had some really cute patterns! I'm so excited to pass these out at the end of the year! 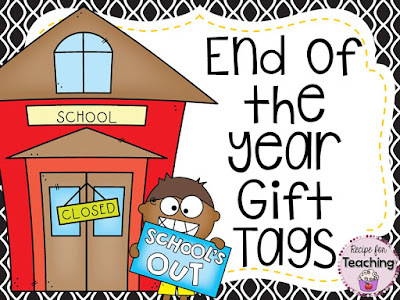 I created a pack with 10 different End of the Year Gift Tag options. If you want to check it out just click the picture to go to my TpT store! I am also including a "Sunshine Coverall" math game and two dice in a baggie with their sunglasses gift. We have played different coverall games throughout the year and my students always enjoy them. The dice also came from the Dollar Store - don't you just love the Dollar Store?!?! If you want to grab the coverall game for your student gifts or just for a fun end of the year game, I've created a *FREEBIE* for you! Just click the picture to download! Have a wonderful weekend!! Hope it is filled with SUNSHINE! !